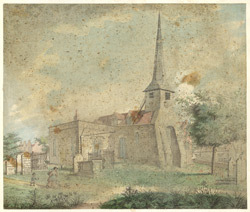 This is the Church of St John the Baptist in Eltham, which is remarkably unchanged since this image was made. Its registers go back to 1583. The town of Eltham developed over many years along part of the old road from London to Maidstone. It stands on a high, sandy plateau, which gave it strategic significance in the middle ages, culminating in the construction of a moated Plantagenet palace there. The great hall and moat bridge are the main surviving palace structures, both dating from the late 15th century. Eltham fell out of favour as a royal retreat somewhat during the reign of Elizabeth I, but gained in esteem in the eyes of the political classes. Sir Thomas More often stayed in Eltham while he was Lord Chancellor. Aside from its more high-flown associations, Eltham was an agricultural area, supplying the major markets in both London and Maidstone.